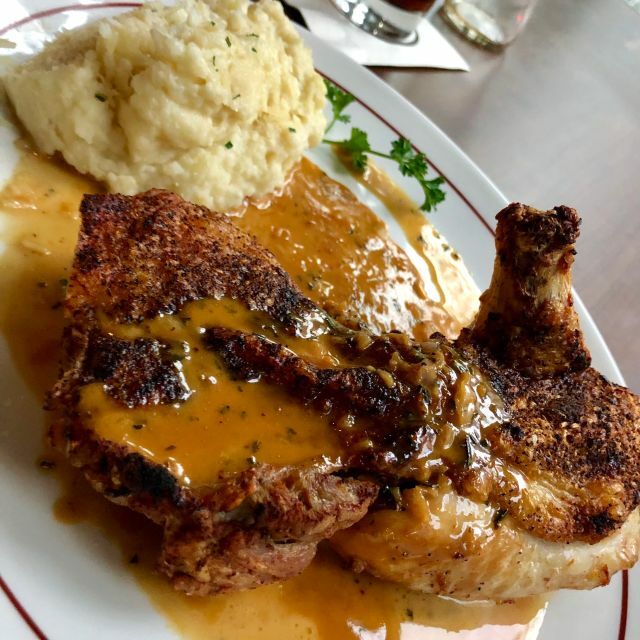 You must make reservations at least 5 minutes in advance of the time at Daniel's Broiler - Downtown Seattle. Parking discounted for Daniel's guests in Hyatt garage. Valet parking available after 4:00pm. Live piano music nightly in the main bar. 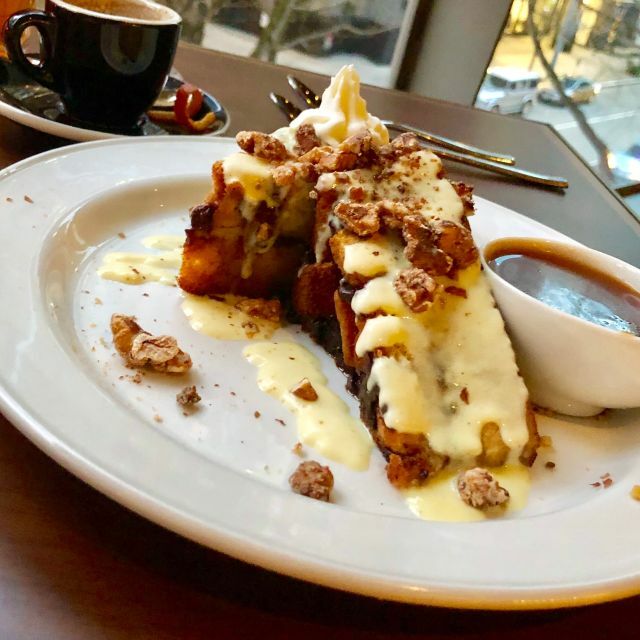 Located on the second floor of the Hyatt Regency Seattle, guests enjoy downtown views with live piano music, USDA Prime Steaks—the top two percent of all graded beef in the nation—as well as other traditional steakhouse favorites and our award-winning wine list. Our Rickhouse Whiskey Bar features a 36 barrel bourbon display wall and offers a wide selection of whiskey and other fine spirits from around the globe. Celebrate Mother's Day at Daniel's Broiler-Downtown Seattle with a holiday brunch buffet from 9am-3pm. Adults: $60; Children ages 6-10: $20; Children 5 and under: Free. (prices exclude tax and service charge). Dinner service starts at 5pm. I love the other two Daniel's... Went to this one Easter, found out they were having brunch. The brunch was just fair. The salad section of the bar was virtually nonexistent. I've seen better - just about everywhere else. The basics, meats and potatoes, were fine. Here're the things that really got me: First, when we sat, neither our waitress nor or hostess had mentioned the buffet. So we were left to fend for ourselves on figuring that out. I had to ask, twice, to have food items refilled on the bar. I asked for coffee, but wasn't at my table when it was delivered. The waitress didn't automatically leave cream, and was out of sight for a while before I could ask for it. But, NO PARKING VALIDATION, REALLY? The only reason we went to the Hyatt was for Daniels. Given we were a party of four, with two cars, that added $36 to the tab. Daniels in Bellevue - we love you! Hyatt? Won't be back. Beautiful restaurant, it was my first time at this location. Staff was friendly, accommodating, and made our night that much better. Food was incredible as always. Excellent service (with 20% service fee). Delicious three course dinner with good price during restaurant week. The creme brûlée was my favorite! Beautiful dining area in new location in downtown Seattle. Restaurant is in Hyatt hotel so there are many tourists and visitors. One drawback is no validated parking for dining. I would come back for breakfast, restaurant week, or happy hour with live music in the bar and lounge. Came for Seattle restaurant week. WE brought our youngest daughter and her fiancee and we all had a wonderful time..Loved the food. Our waitress ,Darelle, was pleasant and more then professional. All the staff was wonderful from the moment we walked in to the time we left. If you are coming for dinner, be prepared to spend some money. If we hadn't been there for restaurant week it would have cost us a lot more then we paid. That being said , we will be back. Apple crumble was very soggy but the steak tasted great. I went for Restaurant Week. Ordered the Filet Medallions, medium rare. The food was good, not great. Steak temperature was tepid. The dessert was TERRIBLE. 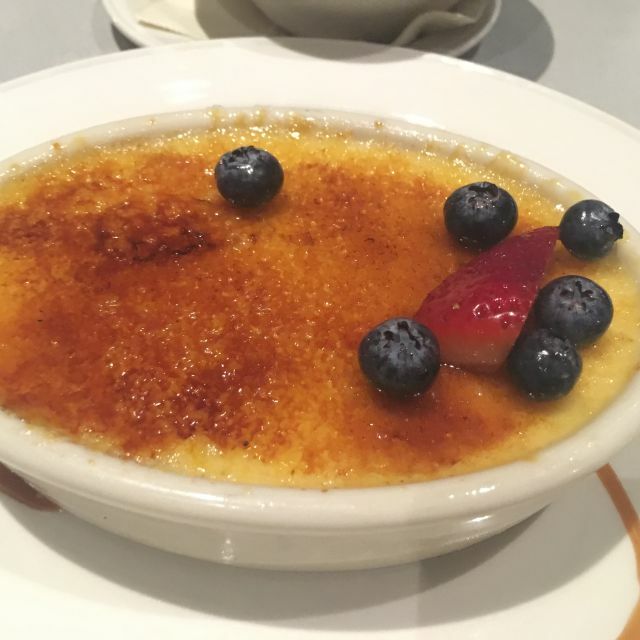 I have had better creme brulee at dinner buffets. We came into Daniels Broiler knowing they had an extensive wine list and looked forward to having some suggestions for pairing with our meal. When we were seated I asked our server if I could speak with the Sommelier. The server did not understand what a Sommelier was, so I asked for someone who could help me with a wine choice and he said they didn't have anyone. So we were off to a bad start. We did end up ordering a bottle we were familiar with, but @ 4x the price we pay at retail we considered it excessive. We did drive in from Woodinville to partake of the Seattle Restaurant Week and try something new. We were happy to find DB had a plant based menu because our daughters are vegetarian though a little disappointed not to have a veg option on the SRW specials. The food was fantastic and the service was good but for the reasons above I would probably not come back. Great service, food, and ambiance. We had a great experience. Everything was great... steak was a bit over cooked but the service and everything else made up for it. Only negative is that we felt a bit talked down to as we were there specifically for the Seattle Restaurant Week special offer. Our server was nice enough, just not very engaging - abrupt, I would say. The food was fantastic. The ambiance and everything else about the venue were wonderful. We will dine again at Daniel's for sure. Server not friendly, but maybe she had a bad day 😔. No croutons for Caesar salad ... they had run out, but we’re making more ... but it would take a couple hours 😮. No offer to substitute salad. Entre was tasty, tho! Daniel's has always been a Go To place . 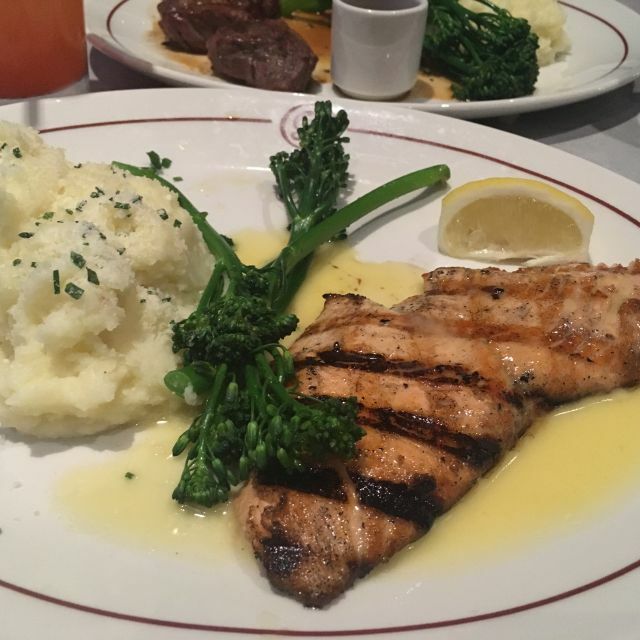 Want a Great meal with impeccable service ? Yep. And for me, this new location is perfect. Will be one of the Seattle restaurants that I will visit frequently. I was a bit disappointed in the restaurant week menu. Just seemed very safe and just ok. It was quite underwhelming. The meal was good but nothing spectacular as you would expect from a Daniel's Broiler restaurant. I'd come back any other time and order off the menu. I'd skip it next year during restaurant week. I booked Daniel's to celebrate my parent's 57th wedding anniversary. Also it was close the Paramount Theater where my parents were going after dinner. The Hyatt Regency is a cold and uninviting hotel. But this is not about the hotel; however, Daniel's motif was not much better. When we were greeted, the hostess did ask about the annivesary, but that was it. It was never brought up again during dinner. Although are reservations were for four people and we checked in as four, they sat us in a booth setuip for six. Please take a moment before sitting your guests and prep the table for the correct number of patrons. As for the food, no complaints. The appetizers were great. 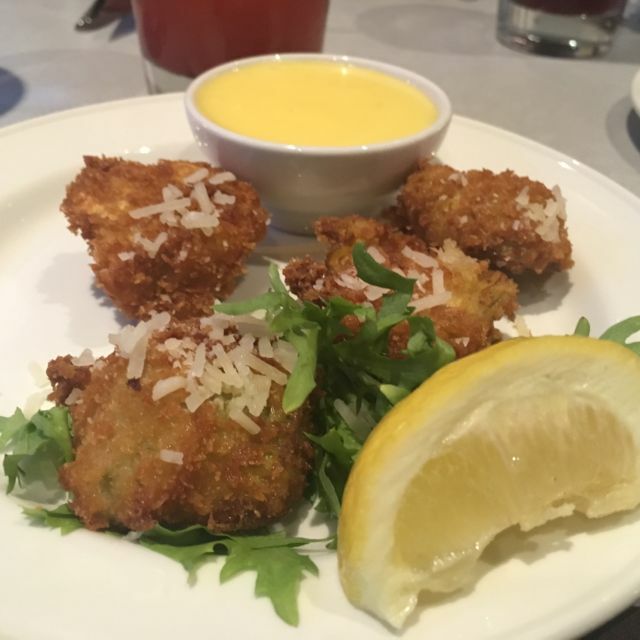 Oysters Rockefeller and fried artichoke hearts. Very tasty. The soups and salads were good as well. The dinners: salmon, filet/oscar, and prime ribs were fine as well. The entrees were very expensive relative to the service and experience. For the same money, go to The Metropolitan Grill. You'll enjoy yourselves and your meal more. Daniel's also added a 20% service charge as a tip. That explains why the service was just okay. No need to hussle when you know you're already making 20% of a $400+ bill. Overall, would I go back? Probably not. There are other steak joints in the city that offer a better experience for the money. The food and service was all good. The sound level was a little on the high side. There was maybe four other tables at 6:30pm for our reservations. We were seating in a table for two next to the window and right beside another diner. WITH LOTS of room where we could have had a more private spot. The server was very kind and the water and soda for my son was filled often and everyone was polite. My roast chicken looked great but the sauce was super salty. 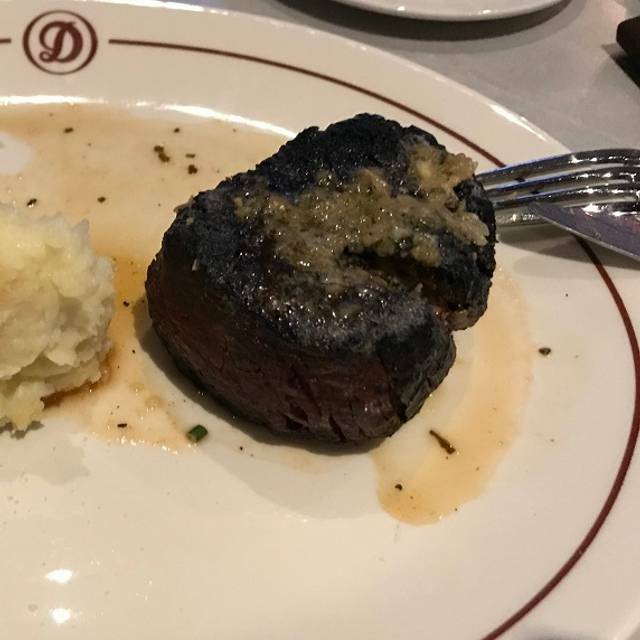 My sons Daniel size filet was pricey and seemed to be over cooked for medium and there was Parmesan on the mashed potatoes that was not listed on the menu. The desert bread pudding was dry and flavorless but the cheesecake was great. The problem was that my cappuccino was brought out about 10-12 minute before my dessert even showed up. The server was so busy with a table of 7... again keep in mind only 3 other tables in total, that it felt like she forgot our dessert. When I finally got her attention to ask, she said sorry the kitchen was backed up... WHAT???? The restaurant was empty... sigh. And my cappuccino was cold. A frustrating end to a dinner that could have been great. Food was mediocre and steak was not cooked correctly. Didn’t have the wine we wanted from their wine list. Service was good, but overall way overpriced for the what we received. We enjoyed a wonderful anniversary dinner at Daniel's Broiler at the Hyatt. Everything from our appetizer, perfectly prepared steaks, to our delicious dessert were delightful. Thankyou for a great evening! Several times we were approached with fooditems we had not ordered; wrong ordered food arrived but was corrected promptly. Our wine was gratis due to the ordering issues. Apologies were made by several staff. Our steak salad was very delicious though. Not the best value, but I like the service. They do have a goold broiler. We appreciate the love and the honest feedback, thanks very much, Ronnie. Have a beautiful weekend and we hope to see you in again soon! Great server, delicious lunch, perfect birthday celebration! Thank you. Happy Birthday, Mrs. M! Thanks so much for celebrating with us and leaving our lovely Downtown team this great review, we appreciate you! On my first visit to the new Daniels I was impressed with the ambience and the service was good. Great actually although some of my parties food was deliver incomplete, I’m chalking that up to newness... the crab soup was delicious but much thicker and creamier than our waiter describe (again,new??) Not complaining about the soup. It was scrumptious, and the cup was much larger than we expected! The sandwiches ordered at the table were much enjoyed, the fries forgettable. I made the mistake of ordering the duck confit salad. If it weren’t for the arugula, it would have been rather tasteless and the duck was dry. Next time I’ll try one of the shrimp dishes or order the teriyaki steak bites. Speaking of steak,of course they are top drawer and you’ll pay dearly for them! Thanks for the love, we hope you'll give us another chance to wow you soon in the future! Abby our waitress took great care of us. It was a special night. My wife’s birthday and 2 nights later waited by Jeff. Another great Job by their staff. I met a local on Maui and she recommended Daniel’s. The staff at the Hyatt Regency Seattle also gave you great reviews. We’re visiting from Hawaii and will recommend you to people that I come in contact with. I’m a Bell Captain and meet new people everyday that I’m working. If I find out they’re heading to Seattle, you can bet I’ll send them to Daniel’s Broiler !!! Food was mediocre but over priced for what it was. Service was terrible. Waiter couldn't get anything correct with our food or drink orders. Then proceeded to chat to the table next to us for 20 minutes while I got our app and food before my drink even came out. Will not be going back. Such a shame for a new, nicer hotel. Skip Daniel's and head the Andare downstairs for WAY better service and food. Don't waste your money as there are a ton of better steak places in the area. Surprisingly disappointing experience. Would have expected the same quality as we have had from other Daniel's. The NY steak temperature was significantly wrong twice. The Swordfish was o.k., but not great. Not a place for views and seemed like a hotel restaurant for those who wanted the hotel location convenience. We had a great time. Food was spot on. Jeff took very good care of us. My husband and I had the best time at Daniel’s. The service was superb. You all went above and beyond my expections and made our anniversary something special. 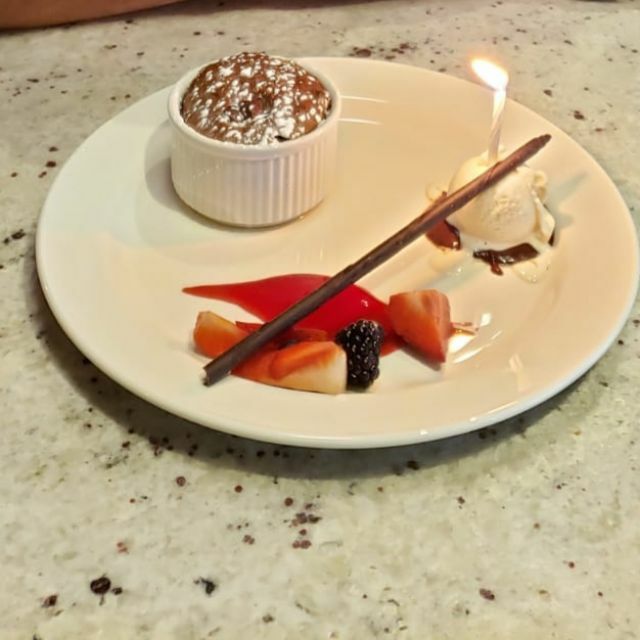 From being greeted with a sweet “Happy Anniversay” to our totally awesome server, Jeff, with his wonderful suggestions, and the food, let’s not forget about the food. My filet was perfect and my husband’s lobster, which I had a bite of, was delicious. This was hands down my best experience at any Daniel’s I have ever been to. And the icing on the cake was the surprise dessert at the end of our meal. It was totally unexpected but sweet none the less. I was super impressed and will definatly recommend the Downtown location to friends and family. Thank you for making my husband’s and my seventh wedding anniversary memorable, fun, and special! Service was wonderful! Love that you have a Plant Based Menu, which my daughters enjoyed! We were celebrating a birthday and appreciated the birthday wishes from the staff. The tofu appetizer was delicious! We look forward to our next visit here! Food and service (Jeffrey was awesome) were both on point and typical of a Daniel's experience. 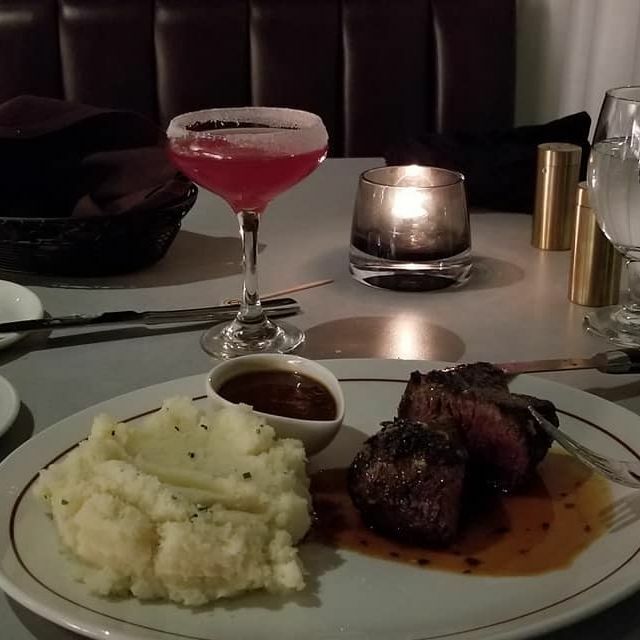 The restaurant is in a hotel and it doesn't feel quite as intimate and cozy as the other locations, but nice to have another option downtown. We really enjoyed the service at Daniel's Downtown. Our server was GREAT! He was cordial, accommodating and very on top of things. The food was just okay, but the ambiance was better. It's spacious enough so you don't feel like you're sitting on top of one another and it's quiet, so you can have a conversation without fighting the background noises. I wish there was an entrance and exit on the Stewart side, as you have to enter on Olive side and walk back toward Stewart in the building. The escalator was broken so we took the elevator, which was confusing. It's digital, so when you press the button for the 2nd floor, it doesn't illuminate on the pad, but displays on the TV monitor. Will I go again, probably not, but I will refer the professionals I support for their business lunches. Steak was extremely salty and prices are insane, given the quality, does not justify the cost. This was our 25th anniversary dinner. We enjoyed time in the Whiskey Bar. Our server for dinner was attentive and nice. Our food was less than expected. The appetizer was tasteless. Our main course of a lobster tail and Rib Eye was tasteless and overlooked. Such a disappointment for Daniel’s. We had this happen once before at Lake Union. They offered us a gift card, but we have no interest. I wish we would have gone to the Metropolitan Grill or another venue that would not be a disappointment. Great Saturday morning breakfast with my significant other! Food was delicious, service was on point and we’ll definitely be going back. My rating is for this particular location. In the past we visited other establishments of Daniel’s Broiler and everything was perfect. Me and my wife work in downtown and frequently stay for the evening concert at the symphony or a theater show. That’s why we were very excited to learn that Daniel’s Broiler is opening a downtown location so conveniently close to our evening shows. What a disappointment! We had a reservation and we were seated immediately and ordered quickly but the waiting was incredibly long. We were told is that this is because my wife’s steak was ordered well-done and it takes time. Finally, when her fillet mignon came, it was totally burnt. Top and sides had black hard crust - bitter and uneatable. Only the middle part was eatable, although without much enjoyment due to overwhelming charcoal flavor. Needless to say, no respectable restaurant would ever serve such a steak to a customer. Certainly, $80 plus tax and tip (auto-added) sounds like a joke, and quite a bad one. I don’t know what went wrong – was it forgotten or cooked twice? Our sympathetic waitress first told us that this is what “well-done” means. No, no, no. 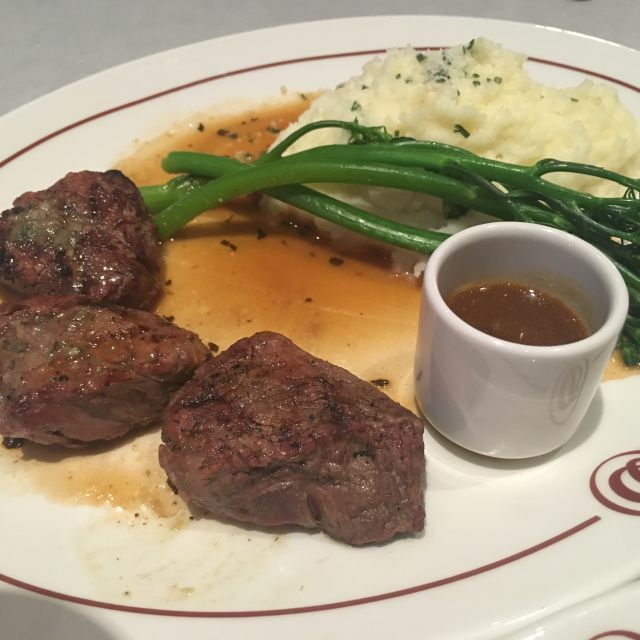 Well-done does not mean burnt, and we had perfectly made well-done steak at other Daniel’s Broiler locations. Then she added that maybe the cooks still were figuring out how to tune the broiler properly. This may be right but why they are training on paying customers? Anyway, we were already in hurry for the symphony concert so we ate the chowder, mashed potatoes, veggies, shared my fish (these items were descent) and left without making more fuss. Definitely, we will remember this experience as the most overpriced piece of burnt mean we ever paid for.